NordVPN has introduced some excellent additional features this year which has made a very good VPN even better. Excellent apps for all devices. Prices includes VAT for EU customers. NordVPN has firmly set itself amongst the leaders in the VPN industry and over the last few years you’ll have seen them everywhere from TV adverts and sports team sponsorship all the way through to quotes in privacy-related news stories. But is NordVPN any good? They’ve been one of our favourites over the past few years but we’ve been checking them out for 2019 to see if they still deserve the reputation they’ve become known for. NordVPN follows the standard VPN offering with a choice of just one type of package which includes access to all their features. This is offered on a subscription basis. NordVPN has expanded from the regular 1-month, 6-month and 12-month offering and now allow you to subscribe for 2 or 3 years on top. It’s worth considering these longer subscription periods because you’ll make the biggest savings. As you can see it’s cheaper to subscribe for longer periods. In fact, with their 3-year package, you’ll get 4 months for the price of 1 paying on a monthly basis. Our recommendation for the best combination of price and risk aversion is to take the 2-year package. It doesn’t lock you in for an overly long time but gives you a greater discount over paying monthly. It’s worth noting if you’re in an EU country you will need to pay VAT on top but you could be sneaky and choose ‘United States’ which has a 0% VAT rate – just don’t tell anyone I told you, shhh. Payment is accepted via Credit or Debit card, a wide range of crypto-currencies using CoinPayments such as Bitcoin, Ether and Ripple. They also accept other types of payment including AliPay, WebMoney, UnionPay, Yandex, GiroPay, SoFort Banking and iDeal. NordVPN currently supports both the OpenVPN and IKEv2/IPSec protocols. They have also recently been experimenting with the WireGuard protocol which at the time of writing isn’t publicly available for all customers but once stable and tested should be released in the near future. If you’re after accessing protocols such as PPTP, L2TP and SSTP then you’re out of luck as these are no longer supported on the service. While the latter two aren’t recommended for security purposes you may miss them if you need them for a specific purpose. NordVPN claims to store no logs of what you do while connected to their service and up until late last year like most VPN services there was no proof if this was true or not. After a slightly rocky 2018, fueled by rumour over links to a data farming company revealed via a legal case, NordVPN made the bold step of having their service and claims tested with a full audit. Late in 2018, NordVPN published the results of this audit to their current customer base. While it hasn’t been shared publicly it is available to all current and future customers and ourselves and other security industry experts have cast their eyes over it. The consensus is that although the audit doesn’t go into great detail you should, in theory, be able to trust NordVPN’s ‘no-log’ claims. One of the reasons behind NordVPN’s success over the past three years is their ability to expand and do so quickly. At current count, NordVPN offers VPN servers in some 62 countries with an eye-watering 5,245 individual servers. When you break this down and compare it to last year’s statistics, while they haven’t expanded massively on individual countries, only adding 3 new locations. They have nearly doubled their amount of overall servers which is nothing short of a miracle. NordVPN covers most locations across the world and apart from Africa which does have minimal coverage in the North and South, there aren’t many gaps across their network. 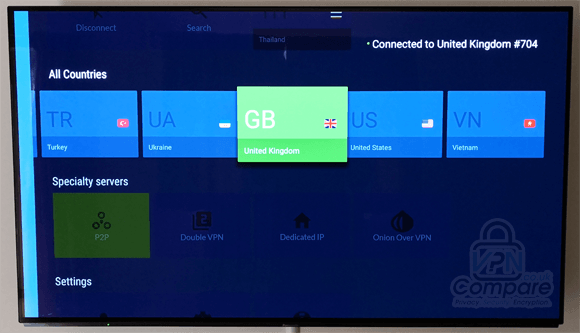 There is even a host of ‘Speciality Servers’ which include options like ‘Double-Hop’ that allow you to send your connection through two different locations. Although these options are limited to specific areas. NordVPN allows you to use the one service on up to 6 devices at the same time. This is a decent amount of devices and while it’s not the highest number available in the industry it is at the higher end of the scale in terms of the competition. There are no limits on how many devices you can install the vast array of apps on, only how many you can use at the same time. It’s unlikely the average user will ever be utilising 6 devices concurrently so you’re definitely future proofed. NordVPN has a host of additional features available on their service which allows them to stand out from the competition. One of the main benefits is their CyberSec feature which has been a part of the service for the past couple of years. Built into their range of apps it allows you to get protection from malware and block other threats such as phishing. While it shouldn’t replace a dedicated anti-virus app it does give an extra layer of protection. It can also be disabled if you don’t wish to utilise it. Another standout feature of the service is how well they work to unblock TV content from across the world. Services like BBC iPlayer, Sky, ITV and others all work well allowing you to watch them from anywhere in the world. Equally, US Netflix is unblocked across the entire range of servers. This allows you to connect to a local server and still gain access to the US catalogue of movies and TV shows which is a neat feature in itself. NordVPN offers apps for all Android and Apple iOS devices and over the course of the last year, they’ve been redesigned somewhat. They still feature the easy to navigate interface that we saw last year but the use of space has been improved allowing for quicker connection. The layout is now more intuitive allowing you to get connected to the servers you want with ease. The upper portion of the app allows you to select a server on a map view while the bottom section allows for connection to your favourite servers, speciality servers or by expanding an individual country list which can be searched for quick usage. It’s really nice that individual servers are also able to be connected to and added to favourites for later use. Behind the scenes, NordVPN’s ‘CyberSec’ feature can be enabled allowing protection from malware and other nasties on your mobile device plus some additional options such as using Obfuscated Servers or using TCP rather than UDP for OpenVPN. Sadly there’s no VPN protocol selection but that follows suit with the entire service. The usual selection of automatic connection options are also available. The mobile apps are some of the best we’ve seen from a VPN provider and will allow you to use them with ease even if you’re a beginner. Just like the mobile apps, the desktop apps available for Windows and Mac OS have also had some tweaks to their design over the past year. Replacing the simple map design a side panel has been added to allow quicker selection of individual countries, servers and speciality servers. These include P2P specific servers, Onion over VPN servers, Double VPN and Dedicated IP servers. This is a really nice addition to the app and makes selecting a server whatever way you prefer much easier and without the need to search through multiple screens. Connection is now a quick and effortless affair. In the Settings area, you’ll find some extensive features. NordVPN’s CyberSec that features across all of their apps is available plus a kill switch. There’s also a smart individual app kill switch if you only wanted certain apps blocking should the connection drop. Advanced features allow you to switch between a TCP and UDP protocol, specific dedicated DNS servers, use Obsfucated Servers and run a diagnostics tool. Again, the usual selection of automatic connection on boot options are available too. Just like the mobile app, the desktop app is one of the better ones we’ve seen. It’s been well designed for a number of years but the little interface tweaks that have been made over the past year have made the user experience that little bit more pleasant. On top of the mobile and desktop apps, NordVPN also offers apps for Linux, browser extensions for Chrome and Firefox and an Amazon Fire TV and Fire TV Stick app. Again, their Amazon app is nicely laid out and simple to use across the big screen. It also has the added benefit that you can unblock many of the Amazon apps such as Netflix, BBC iPlayer and others really expanding the use of your Fire TV / Stick / Cube regardless of where you are in the world. NordVPN has been consistently one of the fastest VPN providers in recent years and last year we commended them on their continued improvements in this area. Over the course of the past few weeks we’ve been using their service for a variety of purposes. Everything from general web browsing and video streaming on sites like YouTube to gaming and streaming in Ultra HD on our Fire TV Stick via Netflix. This was all done via a Wi-Fi connection and we found no issues when carrying out any of these kinds of tasks. For your everyday usage you should suffer no issues. You’re probably wondering how that translates into actual speeds. So for this, we’ve done some tests for you. We took a UK residential internet connection and downloaded an uncompressed test file. The speed achieved without using a VPN was: 63.28 Mbps. As the results show, even at distance decent speeds can be achieved. This would be more than fast enough to stream high-quality video content from across the globe without issues. Across the majority of platforms, NordVPN makes use of OpenVPN using AES 256-bit encryption. Authentication is handled with a 2048-bit RSA key. While this isn’t at the top of the scale it is industry standard and an acceptable level. Some apps make use of or allow the use of the IKEv2/IPsec protocol. As this is known to be unbreakable at this point in time it means your connection is secure. NordVPN updated their privacy policies last year when GDPR regulations came into effect in the European Union. However, they were only updated to comply with those regulations and nothing in terms of what they store (or don’t store) changed because of that. NordVPN claims to be a fully no-log VPN service which relates to what you do while connected to their service and what is known as ‘metadata’. Metadata includes things like times you connected, which server you connected to and other important but on its own none-identifiable information. The service does retain minor details based on your payment which includes your email address and data related to your payment. This is standard practice across the industry. At a glace the policies look sound and with NordVPN recently having their service audited to confirm as such it’s about as good as you’re going to get. NordVPN has been without question one of the best VPN services in recent years and with the additions they’ve made this year they certainly retain their spot at the top. The service has loads to offer in terms of servers, connection points, apps and speed making them one of our favourite providers of the year. Late last year NordVPN published an audit of their service and their logging policy. This was carried out by one of the largest auditing companies on the planet and goes to great lengths to reassure users that NordVPN’s no-logging policy is sound. We really liked the improvements to their apps this year making them easier to use and more intuitive for the features you need quick access to. Their recently released Amazon Fire TV app is a huge bonus to the service allowing you to unblock content and protect your privacy on your big screen. The prices did increase ever so slightly this year but not enough to be noticeable and if you’re in an EU country you’ll now have to factor VAT on top of the price. However, taxes are a fact of life and not a choice by NordVPN and even with this modest increase they’re still competitive on price. Encryption is sound on the NordVPN service and we appreciate them dabbling with WireGuard. Equally unblocking media content from Netflix to BBC iPlayer and many others works better than most services. Overall NordVPN is one of our top choices of VPN for 2019 and if you’re thinking of signing up you really can’t go wrong. Don’t forget they’ve got a huge 30-day money back guarantee too to give you plenty of time to test their service. ExpressVPN Review 2019 – Our Top Choice!